I am trying to use the "Paste key" option to verify the authenticity of the server that I am connecting to (my SiteGround server). I just had SiteGround support double check what I was doing and they couldn't see any obvious mistakes on my end. Re: "Paste key" option failing. You are confirming server's public key. That has nothing to do with your private key. I have a lot to learn about public-key cryptography! I talked to SiteGround, and it seems that many of their support staff are not sure what a host key fingerprint is. As far as I can tell, they do not have access to that information and are unable to provide it to their customers. 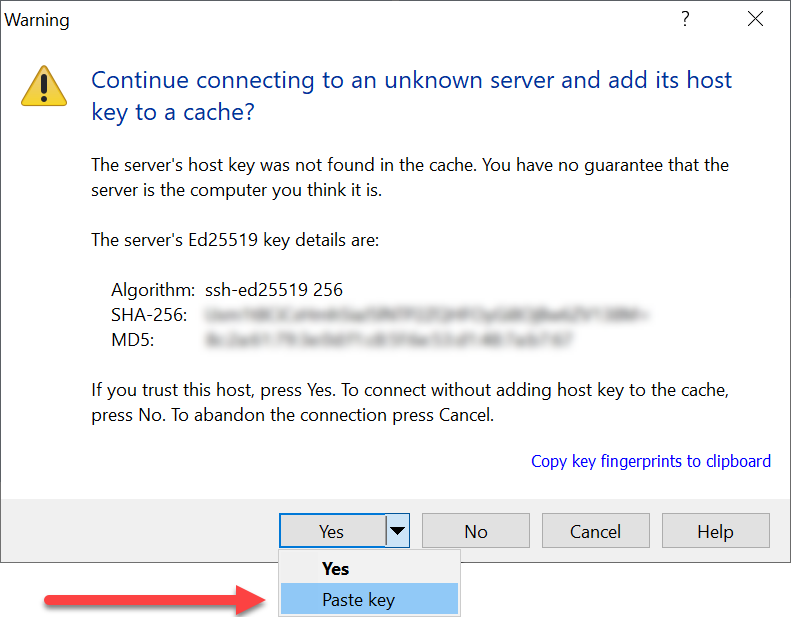 If I want to use the "Paste key" option to verify the server I am connecting to, would I have to generate my own key pairs using PuTTY, or something like that? I believe the the second article linked in my previous post covers all options you have. You cannot generate the host key. A host [private] key is generated when the SSH server is set up. I guess I won't be able to use the "Paste key" option to verify the server, as the hosting company don't provide they host key fingerprint. I just clicked "Yes" and connected normally.